ugly, but interesting. 2 lines i think are neccessary for us. having completed section breakout into today, yesterday, and older is great. todoist.com looks super clean and functional. if a task is assigned to you, but then you are removed from access to the page, then there is no way for to resolve the task or edit it. if a task list is visible but has no tasks (because you removed them perhaps), you then cannot drag tasks to the empty list to move them to that list. very simple tasks designed to duplicate the functionality of basecamp todos. A page type of task list, consisting of a collection of tasks. This means that the permissions and tagging happen at the level of a task list, not at the level of an individual task. You can reorder tasks, assign them to a user in the group, edit/delete tasks, add details, and mark them completed or pending. you can include GreenCloth markup in task details, so that you can link to other pages. you can move tasks from one list to another. you can assign multiple people to the task (from a list of people with access to the page). Your participation for the task list is resolved if all the tasks on the list are resolved. If you are watching a page, it becomes unread if a new task is added or a comment is added. new tasks added/modified since your list page view should be highlighted. should show the date created and date updated. if you make a task list for yourself, all the tasks should be assigned to you. no error messages if stuff fails. no “assign to all” convenience button. no graceful handling of groups with very large memberships (it just shows a checkbox for every user). ‘in-progress’ flag which can be used to indicate that the task is currently being worked on. 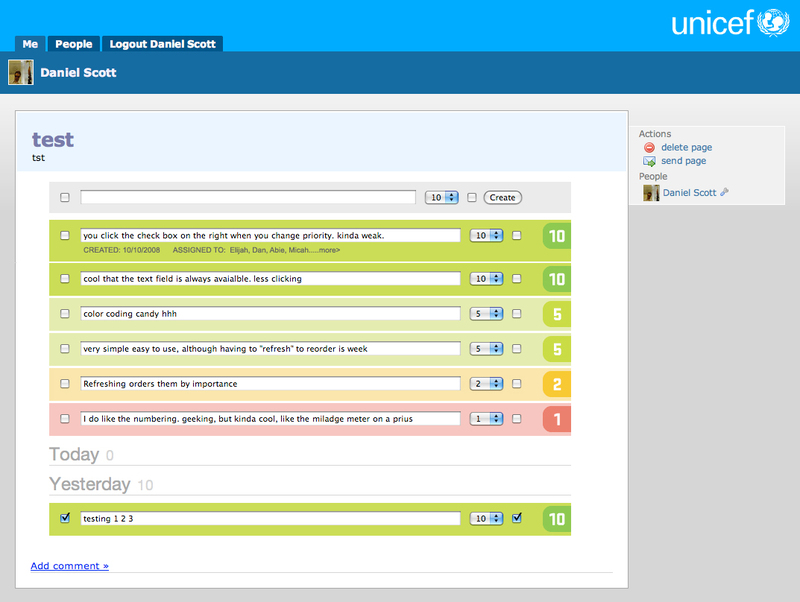 this will allow you to also view a user’s task list and see a breakout of what they are currently working on. ‘waiting on’ flag which would allow you to tell the system that you are waiting on a task to be finished. this will make the task pop up somehow on the task lists of the people it is assigned to, and will also let them know that other people view this task as important. the idea is to try to take the ‘man’ out of project management. what does it mean to have non-hierarchical project management? ‘waiting on’ would be an experiment in answering that question. what’s changed? when you are watching a task list and you view the page after tasks have been resolved or added, that task should be hilighted. Perhaps a task list could have a have a date due. The task list will then appear as a ‘upcoming’ page. Basecamp does this with a separate “milestone” tool. Should the individual task have a due date, or should the entire list, or both? When you view a task that has been resolved since you viewed it last, there should be a notice at the top that says ‘resolved!’ in big letters. Categories for tasks? Many todo lists let you assign color or categories or contexts to your tasks (such as all the Getting Things Done inspired apps). Do we want to do this? Would it really be that useful? How could we do it in a way that keeps tasks clean. Priorities for tasks or task lists? What would be the advantage of this? Priorities are a very common todo list feature, but the cult of GTD has given priorities a bad name. Maybe we can just make due with the order that a task appears in the list. Tracks is a web-based application to help you implement David Allen’s Getting Things Done™ methodology. It was built using Ruby on Rails, and comes with a built-in webserver (WEBrick), so that you can run it on your own computer if you like. It can be run on any platform on which Ruby can be installed, including Mac OS X, Windows XP and Linux. Tracks is Open Source, free and licensed under the GNU GPL. TaskThis. The source to TaskTHIS is made available, strictly as a learning aid, under a modified LGPL license. 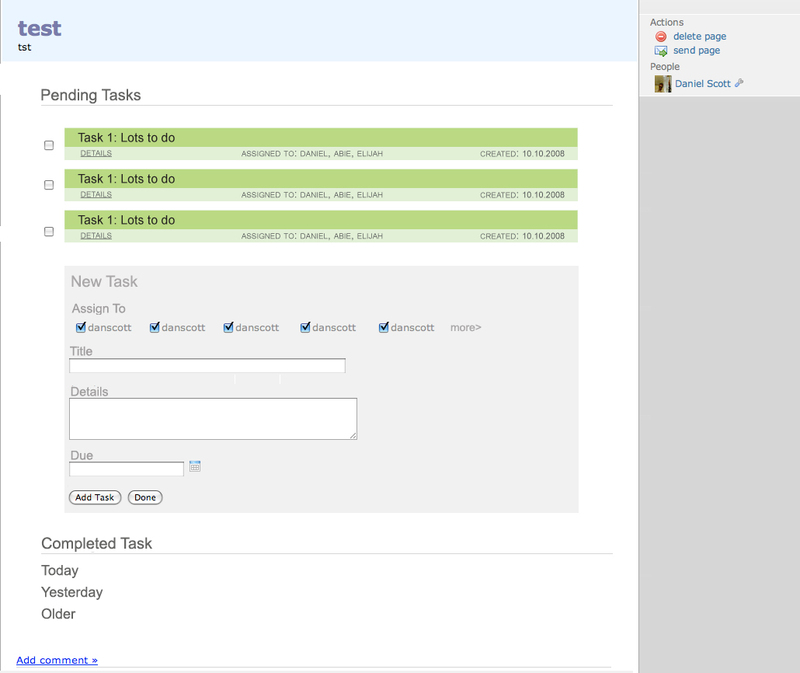 TaskTHIS is a modern, so-called “Web 2.0”, application for managing task lists. You can create tasks with notes and publish them via RSS, or share them so that others can add/complete tasks on your list! that is listed under possible features. it is not obvious to me how to do this in an simple/clean way regarding the ui. it would be useful (at least for me) to have a buttom for each list item to display/hide the details field (currently details ar hidden by default), so i can see my “notes” (details) for this item (without editing it) but not for that other, etc. Something else, it would be very useful for url links stored in the details field to be clickable… and visible. i scratch my head, because i think these are things that are working. for example, on this task list, i created a task ‘a task with details’. if you click on the text, the details pop up. the details contain a url that is automatically turned into a link. perhaps it is not obvious enough that you can click on the text two make the details appear? i was hoping that the dotted underline would help. I like the use of dotted underline to mean “click me for some info that doesn’t open a new page”. it is often used for acronyms. perhaps it is not obvious enough that you can click on the text two make the details appear? ooops… i hadn’t fully noticed the dotted underlines… but, hey, it works! perhaps make the dots a little more contrasting… wysiysinwisims (what you see in your screen is not what i see in my screen). how about multiple selections for the ‘assign to” drop menus? so a task can be assigned to, for example, niko, jessi and brenna. also, seth made it so that you can drag a task from one list to another, although this sometimes doesn’t work.